It's no secret, the Florida Keys has some of the finest fishing in the world. Enjoy catching the big marlin or sails out past the reef, or some quiet back country fly fishing for the wily bonefish - we have the boat to fit and the equipment you need. Our boats are delivered to your location, set up and ready to go. 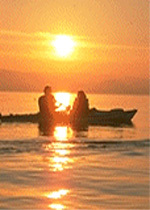 WE OFFER PERSONAL SERVICE - your boating vacation is our highest priority and we will help out. Since we have a large fleet of boats, the pictures you see may not be the exact boat you are renting and may just be representative of the size, style and equipment. LAW ENFORCEMENT, SCHOOL TEACHERS, NURSES & ACTIVE DUTY MILITARY (w/ID) take 10% off with our thanks. F A Q's >> get more info and some answers to frequently asked questions about our rentals, delivery and other and policies. See our boat rental POLICY and rental AGREEMENT. Book your boat or make enquiries -use the orange button near the bottom of the page. frozen bait available at a modest cost. FEES TO COVER COSTS WILL BE ASSIGNED! Eco-touring in the quiet by-waters of the Keys is growing very popular - a great way to see the local birds and marine life in the clear shallow waters. We have the kayaks, paddles and life vests - set up and ready to go when you are.